You meet a lot of people while travelling. Not all of them are still alive. Tenth in the series of World Tour Highlights lists, here are the ten cemeteries, tombs and crypts that made the biggest impression on me. 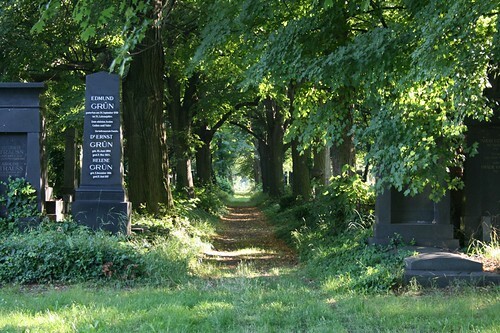 This is a small churchyard cemetery in Berlin’s Schöneberg neighbourhood. Sheryl and I found it while following a map I’d made of filming locations for one of my favourite films, Wim Wenders’ Wings of Desire (Der Himmel über Berlin), filmed in 1987 here and in many other spots in the former West Berlin. St.-Matthäus has some evocative angel statuary and some interesting mausoleums lining the outer walls. It’s a nice calm green spot away from the traffic, and the Brothers Grimm are buried there. I never knew that this tiny graveyard had a name until the time came to research this list. You’ll only find it if you go out from Dingle Town along the curve of Dingle Bay towards Eask Tower. That’s how I first found it eight years before on my last visit, and I was happy to find it again. It’s a small graveyard by the side of the road, slowly being engulfed by the grass and the ivy. A stone angel with outstretched wings covered in orange lichen watches over the scene. 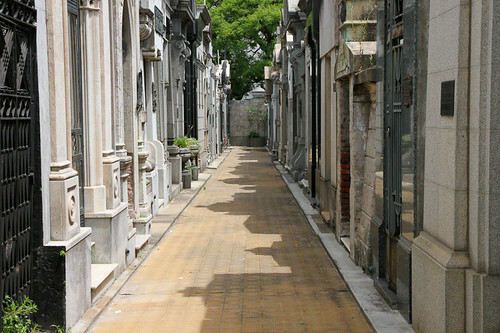 Recoleta Cemetery is two big city blocks wide and the same length, and it’s laid out as a small city itself, in avenues and streets. There’s hardly a tree or a bit of green to be found in this paved necropolis of elegant mausoleums with ornate wrought-iron doors. Time has had its way, here, and many of the little houses are swathed in cobwebs, or have broken panels exposing their depths and the stacked coffins inside. Moth-eaten silk draperies hang in yellowed folds, undisturbed by the feral cats which are the only living inhabitants, who slink silently down the stone lanes. A spooky and shivery bone chapel. The inscription over the door, translated, reads We, the bones that are here, await yours. The walls and pillars of this dimly-lit chapel are crusted with bones to more than head-height, interspersed with rows of skulls. The crosses on the walls hang against stacked thighbones. Two dessicated bodies, an adult and a child, dangle in chains from the vaulted roof. The air is musty and dry and sounds are muted by the strange acoustic qualities of the bone walls. The message that life is fleeting is chillingly clear. Vienna’s Central Cemetery is an immense city of the dead, with a larger population than most living towns. It extends for many hectares of green, grassy lanes. Some districts are open and given over to flat headstones, and others are built up with rows of mausoleums. 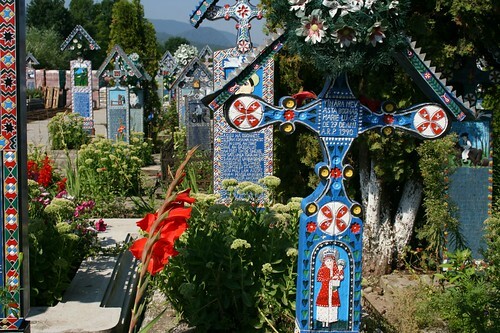 There are Jewish quarters with pebbles piled upon the tombstones, and even a Buddhist cemetery with a Tibetan stupa. A precise count of the inhabitants is no longer possible after the cemetery was bombed during the Second World War; a jumbled pile of smashed tombstones has been left as a memorial to those whose graves and identities were impossible to determine. They’re in illustrious company, at least - many of the great composers have their ornate monuments here: Beethoven, Strauss, Schubert, Brahms, Salieri; even an empty tomb for Mozart, whose pauper’s grave was never found. Coober Pedy is a rough-and-ready opal-mining town in the dead centre of Australia. Nobody wants to build a life there; they come to make their score and move on. 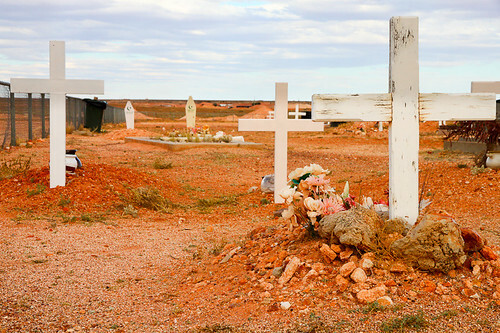 Hardly anything green grows in Coober Pedy except for a few scrubby gum trees, and the cemetery is a barren stretch of red dirt and rocks surrounded by a sad chain-link fence. The graves are rows of long, humped mounds of gravel under the pitiless glaring sun, and the hand-worked headstones, carved hurriedly into whatever red spoil was handy, tell a bleak story of pointless, empty deaths, their emblems beer bottles, pickaxes and shovels. That barren graveyard impressed me with a fascinated sort of loathing, and I’m still thinking about it even now, a year later. “If you hate me,” I remember telling Sheryl at the time, “bury me someplace like this”. 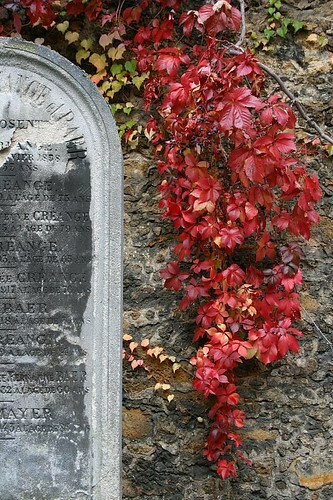 Lovely old gravestones covered with ivy, crumbling, mossy mausoleums and a population of feral cats. Montmartre’s cemetery is quiet and dark. A massive overpass cuts out part of the light from above, and huge old twisted trees filter most of the rest. I found, unexpectedly, the grave of Jean Foucault. 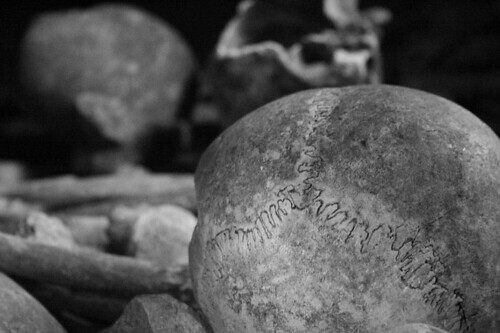 The Catacombs of Paris are a huge network of tunnels filled with stacked bones and skulls. They were populated in the last decades of the 19th century, when it was realized that the overflowing cemeteries of Paris were causing serious disease. The bones were exhumed and brought across the city at night in wagons covered in black cloth and followed by priests chanting the Requiem for the Dead. Huge walls of bones are lovingly and carefully arranged in shapes like arches or crosses, and skulls sit on top of crossed bones. The Sedlec Ossuary in the town of Kutnà Hora outside Prague, is stunningly macabre. 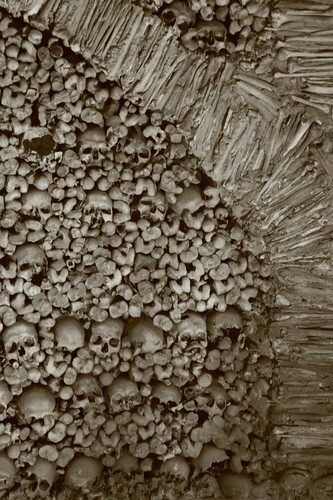 It’s a large room decorated with the skeletal remains of 40,000 people, most of them dead of a plague, that were stacked and wired together by an insane woodcarver in 1870. There are four huge pyramids of skulls in the corners, and the coat of arms of the Schwarzenburg family, sponsors of the project, composed completely of bones, on the wall. 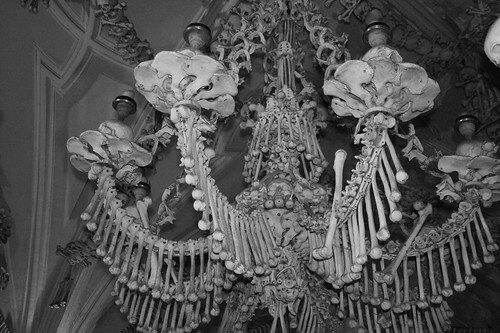 A magnificently horrifying skeletal chandelier, reputedly containing at least one of every human bone, hangs in the centre of the chamber, and garlands of skulls extend from it and drape the vaults and pillars of the ceiling. I blame the silver screen, actually; the need to be young and beautiful forever, unaging and untouchable by time.